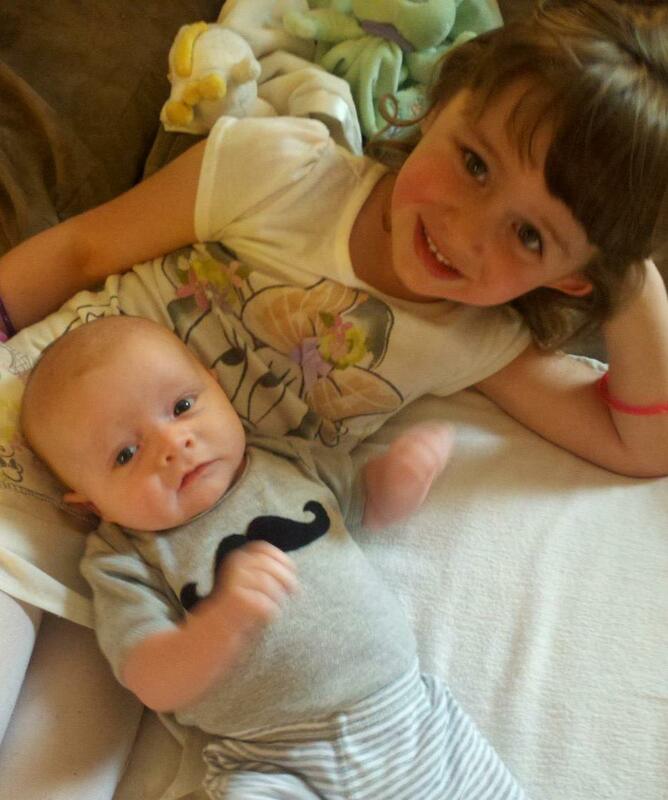 Kayla Ellie (4) & Finnegan Daniel (5 weeks). Those are our two beautiful, precious children. I love them more than I thought I could love anything and I, like every other parent, never wants to see them hurt, sad, or anything but perfectly happy every second of their lives. 12 days ago we got some pretty major news about Finn. The kind of news that instantly stabs you in the gut because that need to keep your kids safe and happy is threatened. Finn was diagnosed with Profound Hearing Loss in both ears. The purpose of this blog is to get info out to family and friends about Finn’s progress without having to rely on facebook, or clogging up your e-mail inboxes, and, selfishly, without having to retell things a million times. I swear I have logged more phone hours in the last 12 days than the previous 12 months combined! I’m starting to forget who I have told what and retelling things I’ve already said to other people (though, this could be because I will be -sigh- 30 years OLD Tuesday). By keeping this blog updated, people can check up on what’s happening with Finn at their leisure. I am amazed and so very grateful for the overwhelming support you all have given us. The need to start a blog is a testament to how many people have asked us about Finn and the upcoming appointments and treatment. I hope this is a good forum for people to find out info, ask questions, and stay as involved as they want. For anyone who doesn’t know the whole story, or has only gotten bits and pieces I’ll start at the beginning. In the hospital when Finn was born he had a high Bilirubin count, he had 5 days of Phototherapy before they finally let us leave. While there he had 2 ABR (auditory brainstem response) tests done- now required by MA law- and he failed both ears, both times. I wasn’t too worried because they said that happens sometimes and there were distractions during both tests so I attributed it to that- plus between the Bilirubin concern -and later, a false positive on a test for a very rare, life-threatening fatty acid disorder- failing a hearing test was the least of our worries. Fast forward 2 weeks later to our automatically scheduled hearing test for him at Mass Eye & Ear and we were walking in thinking this was just a precautionary and probably unnecessary test. We were still soaring from the fantastic news that all of his blood tests had come back within normal limits and our worst fears were behind us. The test took over 4 hours because he was so fussy and when they took us into the room for the results, we were both more focused on how long and boring that test was than on the results that we thought would be fine- to the extent that when the audiologist started talking both of us were kind of packing up/half listening. Then whoosh, she said the line, “It looks like he has profound hearing loss in both ears.” At first, I didn’t react; to be honest, my first reaction was “what the heck is that?” followed by “does that mean deaf? Oh my God, I think she means deaf. Why wouldn’t she just say deaf then? No it can’t be that. Wait, Dan looks pretty upset, I think it is that…” and about 5 more minutes of those types of thoughts. Complete shock followed that as the Audiologist whisked us over the Mass General for a blood test to rule out a virus and sent us on our way with her e-mail address and telling us she’d call us in a week when we’d had a chance to absorb the information. Anyone who knows me, knows just how patient I am, which is not at all. I was on the phone with my friend Stephanie (an Audiologist herself) within the hour. Yes, I am super lucky to happen to have a close friend who is a wicked smaaaht Audiologist. She helped answer some questions I was too numb to ask an hour before and over the next couple of days she was pretty much my own personal AudiologyWiki. It was she who told me about Children’s Audiology program and got me on the phone with one of their doctors within 24 hours of his diagnosis and from there we set up a consultation. After 5 days that felt like we hadn’t taken a full breath, we met with Dr. L (I decided to edit out her name because I have not asked her permission to use her name in this forum) at Children’s Lexington office. She is amazing! One of the most calming people I have ever met. I was in full-fledged spaz-mode shooting her question after question and talking at hyper speed (I know, you are all SO shocked since I am usually so CALM) and she calmly and fully answered each and every one of the questions in a way that put us at such ease- even when the answers weren’t 100% positive. After talking to her, both of us felt a lot better. She didn’t really give us too much new information (after all, I had had 5 days to spend online researching ’til my eyeballs hurt), but she just went into detail about what we knew and set up a game plan for the next year. Just having a plan of attack made things better. She told us that unlike other hospitals in the area, Children’s does things with a team. So instead of getting sent to a million different specialist with varying levels of communication between them, Finn will have his own team including a Primary Care Audiologist (Liberman), a secondary audiologist, a Speech-Language Pathologist (SLP), a Otolaryngologist (basically an ENT), and a few more specialists. May 31st: Meet with SLP from Anne Sullivan Center (Early Intervention) and hopefully get referred to the Deaf/Hard of hearing program at Minuteman Arc in Concord. There we’ll be able to join parent-child groups with families going through the same and also work with some highly recommended people in the most intensive speech-language therapy that we can over the next few years. June 3rd: Meet with Dr. K (Otolaryngologist) to consult about genetic testing, CT Scans, etc. to possibly find out a cause and to plan a more focused treatment. All of this needs to be done in order to see if he will be a viable candidate for CI (Cochlear Implants), which is what Dan & I are hoping for. She will also do tests to rule out any other syndromes that hearing loss can be a by-product of- this will be a huge weight lifted once we can rule that out. June 11th: Back for yet another ABR just to quadruple check. June 27th: Ear Molds done for the hearing aids. July 18th: Finn’s first Hearing Aids- these probably won’t allow him to hear, but there is a chance he has hearing above 90 decibels (think a loud rock concert being like a whisper) and even if he doesn’t, the hearing aids could stimulate the brain and any stimulation would be helpful for development later. Over the summer and the next few months, we will go every 2 weeks or so to get new ear molds done because his ear canals will be growing so fast! September-ish: At some point we will be given an American Sign Language tutor and hope to learn that as a family. Even if he is a CI candidate, we still want to learn ASL. This way we can communicate with him prior to the surgery and in the future if he is swimming or if there is a malfunction in the implant, we won’t ever have to go without being able to communicate. Also, I want him to feel included in both the hearing and deaf communities and I feel as though ASL is essential for that. If he ends up not qualifying for CI due to structural issues in his ear, then we will already have the ASL set up to use. Now obviously this is not what we expected for Finn and yeah, sometimes in an unguarded moment, I will think of something that he might miss out on in the future and it hits me hard, but honestly the most frequent emotion I have felt over the last 12 days is gratitude. We are so thankful to have such a wonderfully supportive family on both sides that love us and our kids fiercely. We are lucky to have friends that are there for us to vent to or just to spend a few hours having fun with (and I have an added bonus of counting both an audiologist & an SLP as very close friends). We are tremendously fortunate to have one of the BEST Children’s hospitals in the country for Finn’s treatment and for it being 2013 with the incredible technological/medical advancements we have to choose from for that treatment. Well, I think that is quite enough for now! Please do not hesitate to ask any questions. I don’t mind answering anything. Katie it seems like you have such a great attitude about all if this. Fin is lucky to have been born into such a living and caring family. As incredibly hard as all of this is for you, I’m sure you’ll get so much back! I know everyone says this, but if there is anything I can ever do please don’t hesitate ( no matter how small it may be). We miss you at work and can’t wait to meet the little baldy! Katie, This is a very challenging time in you life. As mothers, all we want to do is protect our children. You are strong. Your strength will carry you far where your children a concerned. I have no doubt in my mind that you will take this unforeseen set of circumstances and turn it into a positive outcome. In a few months you won’t be able to imagine Finn any other way, or what your life was like before he joined your family. He, and you are lucky to have such a wonderful family and support system in place. katie and Dan…you two are amazing parents! Just seeing the way you guys have been with Kayla, we all know that Kayla and Finn have the best parents ever!! I feel so proud to have such an amazing daughter and son-in-law! It may have been shocking news at first to learn about Finn’s profound hearing loss, but I think everyone who knows Kate and Dan, realizes that Finn is a very lucky little guy to have two parents that will go to the ends of the earth to do whatever it takes to help him. He’s so adorable and you know that anything you both need, we are all here , don’t ever hesitate to ask..
Finn can’t be in better hands. I will do anything for you kids. I got a little emotional when I found out about Finn. He is my first Grandson and He gained and huge spot in my heart the moment I held Him. Every time I hold Him in my arms I feel blessed. I know you two will be OK. Like i said if you need anything just ask. I love all of you. We do have some services coming to us on weeknights, including the ASL tutor- Kayla’s first question when we told her about Finn was “Can I learn sign language! ?” so she will be as involved as we can manage. The daytime services won’t be feasible for us because of work, which is a bummer since that is when most of the parent-infant groups meet, but I am sure we will work through that.